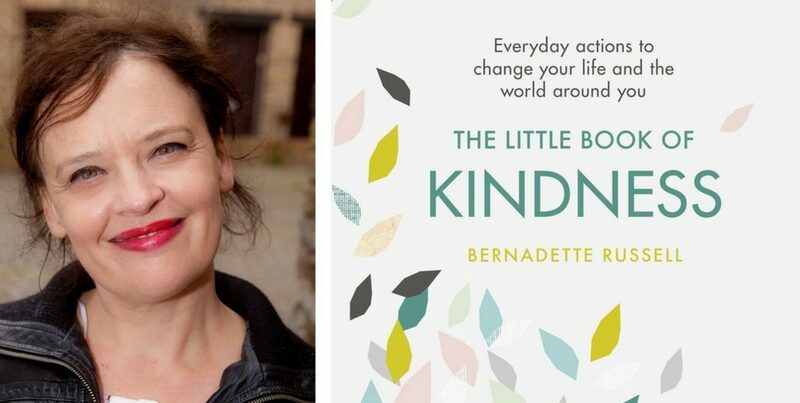 Author Bernadette Russell’s new offering, The Little Book of Kindness, offers inspiration on how even the smallest actions can impact the world around you. Good News Shared sat down with her to learn more. Welcome to Good News shared, Bernadette Russell. We love your new book, The Little Book of Kindness! Can you start by telling us a bit about who you are as a writer? I’m a performer with so I usually perform what I write – I perform short stories with my company White Rabbit. For the last 10 years we’ve run a live lit night every month so my writing has been geared towards performing my storytelling. It’s only by a strange coincidence that I was asked to pitch and write this book. To be honest, as a writer and as a person, I’m more interested in fiction than non-fiction. But I’m really fortunate to have had this opportunity and I’ve gotten more interested in the broader idea of what we define as stories. We’re all telling stories, aren’t we? I’ve become interested in how the story of kindness is universal, even from country to country and across continents. Stories of heroism and kindness pop up everywhere and at the very core the same kind of things happen everywhere when it comes to kindness. How long have you been working on this project and how did it come about? It’s been going for a long time – I started it August 18th 2011 at half past three. I literally know the time! In 2011 we had riots here in the UK and I was at the Edinburgh Festival, which I’m at every year, and I was in my favourite café and they turned the TV on. It looked like some apocalypse was happening. London was on fire, people were looting, and all that. The sound was off and I was thinking ‘What is going on?’. The riots were spreading and I was far away from home and I have to say that the reaction depressed me beyond measure. It was so racist – David Starkey even said that ‘White people had become black’, people were asking for martial law and there was this sort of ‘poor hate’ where poor people and young people were being blamed. It was really frightening for people and I was plunged into this thought process about what was going on in the world: oil shortages, corrupt politicians, species dying out, sexism – it was this whole range of things and I kept thinking I couldn’t fix any of this – I didn’t know what to do that could matter. It was like this big fiery storm that broke the camel’s back and I felt quite helpless. On the 18th of August I was in the post office and there was this man in line in front of me. He was young and had a hoodie and I kept thinking he’d probably been treated like a rioter just because of the way he looked. So I went home and told my partner and then posted it on social media. I had about 7 friends on Facebook and 3 followers on Twitter but I just did it. There was nothing clever or planned about it – I just thought I’m going to give this a go. I think what happened that first year is that it caught people’s attention because I just carried on. Loads of people joined me and eventually I got asked to write a children’s book based on it. I wrote it, then wrote another children’s book and then I ended up doing things in schools, touring around the States at schools, it was even made into a radio documentary in the States – it just all snowballed from giving that young man 50p. I never expected this experiment kindness to dominate, in a good way, everything. Tell us about the book. Is it a book of advice or a book of suggestions? What is it all about? It’s a book of suggestions. It’s got loads of stuff in it but to an extent it’s a bit of a provocation. It’s to give people ideas and to make them think. It’s in ten chapters, so there are chapters like ‘Be Kind to Yourself’ or ‘Be Kind to Your Neighbours’ or ‘Be Kind to the Environment’. It’s got loads of suggestions and some excerpts from the year I first started this. What will people get out of this? Is there a template about how to be kind or… ? It’s pretty clearly set out, such as with the chapters and such, and it’s filled with practical suggestions, like things to do. It’s almost like I’ve written it for the person I was back in 2011 when I was thinking ‘What on earth can I do to make the world a better place when I’m just this tiny little person and there are all these troubles’, although it feels like there are more troubles now than there were then! Hopefully what readers will get is a book of ideas that will help them spread kindness, but also the main thing is hopefully that the message that you can’t fix everything yourself or at once, and nor should you try to. But don’t let that make you feel disempowered because something is always better than nothing. Is it the idea that if we all take these small steps the cumulative effect will be quite massive? When he told me that story I thought that yes, that’s kind of it: if the very least you’ve done has made a difference to one other person or situation, when everyone’s small efforts are joined up it becomes something big. That’s quite interesting. I interviewed a young man the other day and as we sat on some steps having a coffee and talking he saw a woman trying to get her pram up the stairs. He excused himself, jumped up, and helped her, and she was incredibly grateful as no one else was helping her as she struggled. That’s exactly it: it doesn’t take much and it actually makes you feel better just by noticing the kindness around you, because we’re buried under the opposite kind of stories, so noticing that there are actually far more kind stories is a great way to start thinking and acting. We’ve been almost trained not to see the kind stuff and only notice the bad things but there really is more good than bad and we should start paying attention to it. I’ve read that if you do something nice for someone else it releases endorphins in your body, so giving kindness and being nice seems like it’s also very healthy. Yes, science is kind of catching up with philosophy and the really interesting thing is that until fairly recently there have been hundreds of studies about anger and no studies about compassion, or hundreds of studies about why people get divorced but very few about why they stay together. So the scientific focus has been on more negative behaviours but that’s really shifting, particularly at American universities. And now we can see, it’s absolutely been proven, that acting with compassion and kindness releases oxytocin, which is the same hormone that’s produced when women breastfeed and it’s what your body produces to make you feel good. It’s like a free high we can get when we’re kind. So who is the ideal reader of this book? I don’t really know! But if I’m honest I think it’s going to be one of those books that is at the till in the shop and is picked up as a gift for someone you care about. Bernadette Russell, thank you so much for taking the time to speak with us at Good News Shared. It was very kind of you. The Little Book of Kindness was released on 7th September 2017. You can order it online or buy in shops.